If you had any inkling of rapping ability and you were close with Mobb Deep in the mid 90s, you had it made in the shade. Big Noyd possessed both of those qualities and, needless to say, garnered a decent amount of attention for his verses on some of Mobb Deep's tracks, particularly the one on "Give Up The Goods (Just Step)" off of The Infamous. Due to his incredible verse on the aforementioned song, Big Noyd scored a contract and was then able to lay the groundwork for his debut album, which would be entitled Episodes of a Hustla. Unfortunately for Noyd, though, he was incarcerated around the time the album was being recorded, and, because of that, Episodes of a Hustla was never completed and, thus, was very short, spanning only 11 cuts, only eight of which were full-length records. 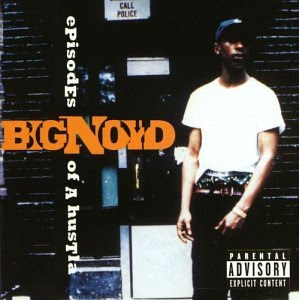 That said, Big Noyd's freshman effort was held in high-esteem by many due to his consistency as a rapper and Havoc's production (he produced all but one song on Episodes of a Hustla, and that song was the intro), as it was blessed with the same type of sound that The Infamous became so famous (no pun intended) for. It's also worth noting that Prodigy is present on seven of the eight actual songs on the album, so Noyd and Prodigy essentially pulled a Ghostface Killah/Raekwon here. Well, I don't really have much more background information to give on Big Noyd's first record, so I'll just kick the review off. If you've been following this blog at all, you'd know how much I hate reviewing album intros because I feel like they're a waste of time. However, I made one of the few exceptions I'll ever make in the case of "It's On You," as the beat by Charlemagne (this is the lone song on the album that wasn't laced by Havoc) is nuts. You have to wonder why Big Noyd decided to use this banger as the album intro. Perhaps he never got a chance to rap over it because he was imprisoned? Havoc has arrived. His beat here is sick, consisting of his typical dusty drums and an ominous piano hit at the end of each bar. Prodigy aids Noyd on this cut and sounds ridiculously good over the instrumental, and why shouldn't he? It is a Havoc beat, after all. One of my favorite tracks off of the album. I've gotta admit; this does not sound like a prototypical Havoc beat, as it sounds much more subdued than the good majority of his other work (his earlier work, anyway), but, nevertheless, "All Pro" still sounds pretty solid. It's not as good as "Recognize & Realize (Part 1)" or anything, but it's enjoyable in its own way. Ty Knitty and Twin of the group Infamous Mobb make appearances on this cut, as does Prodigy. I found it odd how this track was titled "Infamous Mobb," and yet, not one member of the actual group appears on the song. Anyway, this record is decent, as Big Noyd's flow over Havoc's solid instrumental is pretty damn good, and Prodigy does not disappoint with his verse. I will say, though, that these past two cuts haven't been anything worth writing home about. This was a fine way to get Episodes of a Hustla back on track. "Usual Suspect" is easily one of the album's best records, as Havoc's beat kills (those drums...) and Noyd absolutely tears it to pieces. Prodigy is on this, too, but he only drops an extremely short verse (if you can even call it that) during the cut's waning moments. If you're looking for a song to bump in your ride throughout the summer, you really can't go wrong with "Usual Suspect." The first thing you'll notice (hopefully) about the album's title track is that Havoc's beat is unbelievably mesmerizing. I'm sure you can also tell by now that Episodes of a Hustla was recorded right in between The Infamous and Hell On Earth, as Havoc's instrumentals seem to combine elements from both albums, displaying that he was at a sort of crossroads (a good crossroads) in terms of which route to go. Oh, Big Noyd sounds pretty nice over this, by the way, and all Prodigy does here is drop the hook. I like "Part 1" better, but this is still alright. Havoc makes his first appearance as a rapper on Episodes of a Hustla, as both he and Prodigy join Noyd on this cut. His instrumental comes across as a bit lazy, though. I don't really have much else to say other than the fact that "Recognize & Realize (Part 2)" isn't the kind of track that I will be playing on repeat. It takes a while for Big Noyd to actually start rapping on "I Don't Wanna Love Again," but that's okay, because this song is really good. Havoc's beat is ill (that choppy piano hit at the end of every other bar really made this record), and female R&B artist Se'Kou comes through with a great guest spot, crooning an outstanding hook and laying down some nice vocals to boot. Noyd's part is worth the wait, too, as he sounds phenomenal on this. The original was great, and the remix (which contains the same lyrics by Big Noyd but a different beat by Havoc) is nearly as good. The production is much more soulful than anything you'd ever imagine Havoc creating, as his instrumentals are usually always of a grimy nature. You should have noticed that I used words like "solid" and "decent" a lot in reviewing Episodes of a Hustla, because that is exactly what this album is. It certainly is no The Infamous or Hell On Earth, even if it possesses the same type of feel, but honestly, how many albums can really measure up to either of those two Mobb Deep classics? Big Noyd is certainly a capable rapper who sounds great over Havoc's production, and, after listening to his short debut album, you're left wondering what he could have done with this project had he not gotten thrown in the slammer. Perhaps Episodes of a Hustla would not have been any better if it were longer, but, on the other hand, maybe Havoc would have come up with a couple of bangers for Noyd to kill? Who knows. I have to say that one thing I didn't like about Big Noyd's first album was the amount of Prodigy appearances, as it leads me to believe that Noyd was not confident enough in his abilities (and I don't know why that would be the case) to record a full-length LP on his own. Not just that, but why seven Prodigy features and only one by Havoc? All in all, this was a nice effort by an upstart rapper who never really got a chance to live in the spotlight due to his imprisonment. As I said previously; who knows what would have happened had Big Noyd not gone to jail, because it is blatantly obvious that Episodes of a Hustla had the potential to be a near-classic had it actually been completed. I'm not going to recommend that you go out of your way to listen to this album, as it is not anything extraordinary, but I will say that you will most likely not be disappointed if you do, because, my little criticisms aside, it really is a decent effort overall, as every song on here is, at the very least, listenable. a very slept on dude! dat dude is so under rated that its not even funny. big noyd live on! he somewhat reminds me alot of the late great Big L. r.i.p.